“we have some exciting news to share about Windows 10 devices”. The event is scheduled to take place at the Skylight at Moynihan Station in New York City at 10am EDT (2pm GMT). The event is expected to be where Microsoft showcases the next generation devices it’s been working on in the Windows 10 eco-system and also possibly speak on improvements coming in the next wave of Windows 10 OS updates. Devices like the next flagship and premium mobile devices(Lumia’s) code named “Cityman and Talkman” with the Continuum device are expected to be announced, maybe we will get to see a Surface phone designed for the enterprise world, maybe not. The next generation of the Surface Pro is a sure possibility with rumors of a 14″ being débuted. The next version of the Microsoft Band is also another device that is expected to be showcased at the event. As to whether a developer version of the Microsoft HoloLens will be made available will be know after the event, even if we don’t get to have it, I’m sure Microsoft will talk about it and show improvements and new ventures it’s undertaking. If you are an IoT person maybe there might be some devices for you as well. There are rumors of an Xbox One console being announced as well. I think Microsoft will also display some devices from it’s partner hardware companies, probably those exhibited at the recent IFA event in Berlin. 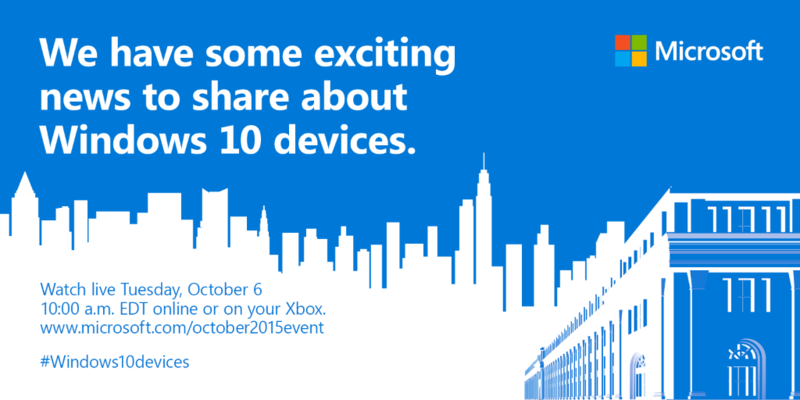 You can stream live the Windows 10 devices event on Tuesday October 6th from the web online or on your Xbox.